Every so often the stars align and something magical happens... In this case, I'm referring to the best kind of magic. Food Magic. 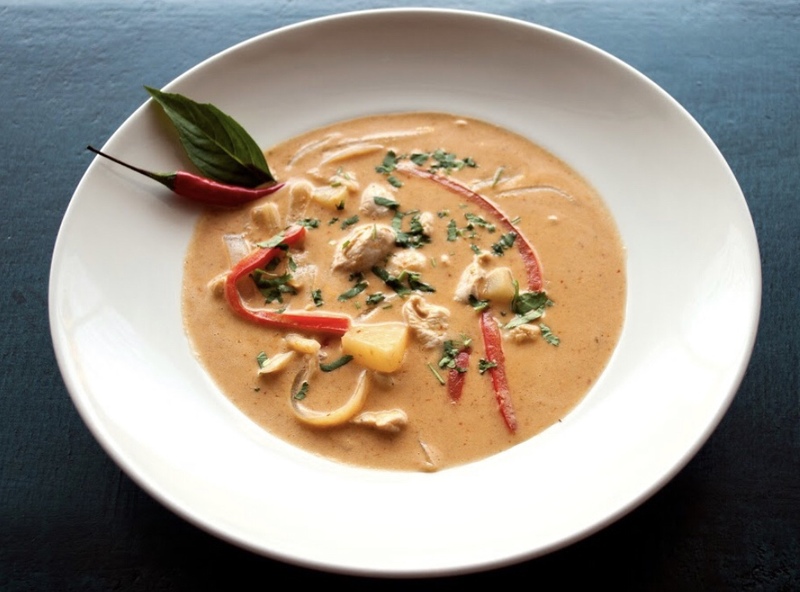 When on a quick Holiday Vacay/Buisness trip to Pensacola we couldn't decide where to eat for dinner, our friends suggested Khon's on Palafox, a downtown restaurant they’d eaten at years before, that had my current obsession, Panang Curry. I was in. Reservations were made. Eyeshadow was applied. To say that Downtown Pensacola is adorable at Christmas time is an understatement, it is perfection and I highly suggest a visit. Khon's sits in the heart of the downtown main street, Palafox. It's an intimate restaurant with majorly cool vibe. Upon arriving we were greeted by one of the owner's, Winston, who was excited to tell us about his restaurant and brand new vegan menu hitting the restaurant soon. I know, vegan!? Our hostess is a self proclaimed "crazy vegan" and we are always looking for great places to eat that everyone can enjoy. So this was already a major win. Now, let's get to the good stuff... THE FOOD. When I say that it was among the best meals I've ever had, I mean BEST MEALS EVER. I can't use enough capital letters here. We had the distinct pleasure of chatting with the chef and other owner, Dot, who explained why fresh food and hand-making all the dressing and sauces is so important to him. We could taste all of the love put into our meal. The restaurant is named for Dot's father, who runs a school for local children in Cambodia. The appetizers were so filling we almost didn't have enough room for the main courses. We powered through. The spicy tuna nachos were so good I almost wanted to order another plate. The entrees are definitely shareable and so comforting. Everything was so fresh and delicious, that I am just running out of adjectives. Oh and let's not forget my new favorite drink, the Good Morning Vietnam was heavenly, I could drink it with brunch... or for brunch. *Pro Foodie tip* Save room for dessert! The Vietnamese Coffee Pudding is heaven. Bottom line, if you’re looking for a Pensacola restaurant that will not disappoint, check out Khon’s on Palafox. Planning a trip to Pensacola FL? Then be sure to check out our Pensacola Travel Guide HERE!